We offer a novel predictor of U.S. economic growth. The predictor is termed IRRA (Implied Relative Risk Aversion). 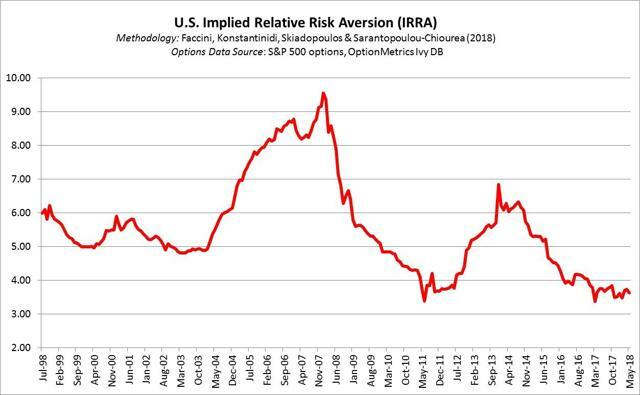 IRRA is the risk aversion of the average U.S. investor, extracted from the market prices of the European S&P 500 options. We find that IRRA forecasts the U.S. economic growth more accurately than the existing predictors of U.S. economic growth when used in conjunction with them. An increase (decrease) in IRRA predicts an economic recession (economic expansion). Many forecasters were caught off guard in predicting the 2008-2009 Great Recession. This prompted researchers to consider the need for a better forecasting gauge to predict U.S. economic growth. In the following, I will describe a novel variable shown to accurately predict the future state of the U.S. economy in conjunction with existing economic indicators. This new, proposed gauge, referred to as the Implied Relative Risk Aversion (IRRA) is extracted from the S&P 500 index option market. Researchers in "A New Predictor of U.S. Real Economic Activity: The S&P 500 Option Implied Risk Aversion," including myself, argue that it should be added to the list of the existing economic indicators for the future state of the U.S. economy. We also find that it is successful in predicting the future state of the South Korean economy. Our proposed variable is computed from the market prices of index options. It is a natural candidate for forecasting the future state of an economy, provided that the index option market is highly liquid. Why do we need another predictor for the future state of the U.S. economy? Real Economic Activity (REA) is the activity of producing goods and services. The gross domestic product is a common way of measuring it, yet there are also other measures such as the industrial production index, non-farm payrolls, real retail sales, housing starts and aggregate indices. The growth of REA measures what is called economic growth. Prediction of economic growth is of ultimate importance to policy makers, central banks, and investors. As a result, a number of variables, drawing on information contained in asset prices (e.g., term spread, credit spread, commodity prices), are used as predictors of the future economic growth over time (e.g., the next month, quarter, year). However, The Great Recession in the U.S. and Europe, which followed the 2007-2008 financial crisis, caught all interested parties by surprise. This has highlighted the need to develop more accurate predictors of economic growth. We diverge from the ongoing practice, which uses variables from the bond, commodity, and stock market, and focus on the option market, which attracts sophisticated investors. Hence, market option prices are expected to contain useful information, which may not be contained in the market prices of other assets, for forecasting economic growth. In "A New Predictor of U.S. Real Economic Activity: The S&P 500 Option Implied Risk Aversion," authored by Renato Faccini, Queen Mary University of London; Eirini Konstantinidi, Alliance Manchester Business School; Sylvanna Sarantopoulou-Chiourea, Independent Authority for Public Revenue, Greece; and myself, researchers offer a novel predictor of U.S. economic growth and document that it should be added to the list of existing economic growth predictors. The study has been published in the journal "Management Science" and has been covered in Forbes, The Wall Street Journal, and others (it was also nominated for the EFMA 2017 Conference Global Association of Risk Professionals (GARP) Risk Management Best Paper Award). A full working paper version is available online. IRRA is the risk aversion of the average U.S. investor, extracted from the market prices of the European S&P 500 options. A decrease in IRRA predicts an increase in economic growth because investors boost investments when they become less risk averse. Conversely, an increase in risk aversion points to a slowdown in growth because investors lower investments when they become more risk averse. IRRA can be computed every day. In our study, we compute it at the end of each month. Findings: How well does IRRA forecast the growth of the U.S. economy? We find that IRRA forecasts the U.S. economic growth more accurately than the existing predictors of U.S. economic growth when used in conjunction with them. Technically speaking, we compared the forecast errors (i.e. the realized value of economic growth minus what was forecasted for this variable) from two models. One model included IRRA as a predictor alongside other popular tools to forecast economic growth (e.g., term spread, credit spread, commodity and equity pricing factors, the Baltic Dry Index). The other model used this same set of tools without the IRRA. Note that the values of some of the traditional predictors, such as the commodity factors, are not readily available and, hence, we took extra care to construct them. We estimate the parameters of the variables used as inputs in the models at the time where we stand (i.e., at the end of any given month) with information from the previous time periods to form forecasts for the subsequent periods. We re-estimated the parameters of the models and we formed new forecasts of economic growth as we moved forward in time. This is exactly what a real-time investor/policy-maker does: at any point in time, he/she uses the available information in order to form forecasts and updates them as he/she moves forward and collects new information. This is termed out-of-sample forecasting. Eventually, this process delivers a time series of forecast errors for each model. We used a measure to evaluate how one model performs against the other, i.e. the model which performs best is the one which delivers the lowest forecast error over the period of consideration. The period over which we examined the comparative "out of sample" performance of the two models runs from October 2007-August 2015. This is also a period of particular interest because it includes the onset and development of the recent financial crisis and the subsequent significant economic recession (The Great Recession) and the quantitative easing conducted by the U.S. Fed. This is a period of time where standard predictors failed to forecast the forthcoming realized recession. As a result, we have posed a high hurdle for our IRRA predictor to overcome. We should also note that in addition to comparing forecasts obtained from the above two models, we also examined the forecasting ability of IRRA using information from a large dataset used by the Federal Reserve Bank of St. Louis (FRED) with 134 U.S. monthly macroeconomic indicators. This approach to forecasting avoids the need to specify in advance the predictors to be used and instead allows the data to determine the predictors. Again, we find that IRRA should be included in this large data set in order to form more accurate predictions of U.S. economic growth. To proxy U.S. economic growth, we consider six U.S. economic growth alternatives sampled at the end of each month from July 1998 to August 2015: log growth of industrial production (IPI), log growth of non-farm payroll employment (NFP), log growth of real retail sales including food services sales (RS), log growth of housing starts (HS), Chicago Fed National Activity Index (CFNAI), and Aruoba-Diebold-Scotti (ADS) business conditions index. The values of CFNAI and ADS signify growth or recession in their construction; hence, there is no need to compute the growth rates for these two. We find that the extended model, which includes IRRA as a predictor, outperforms the restricted model, which does not include IRRA. We arrive at this conclusion based on forecasts of the U.S. economic growth over different horizons (one, three, six, nine, 12 months) individually. In addition, we find that the relationship between IRRA and future economic growth is negative. This means that when IRRA increases it is a sign of forthcoming expansion in the economy, and when IRRA decreases it is a sign of a forthcoming recession. The fact that we find that (i) U.S. IRRA predicts the growth of the U.S. economy, and (ii) there is a negative relationship between IRRA and economic growth can be explained intuitively by the very nature of IRRA. Regarding (i), IRRA is computed from index options and hence it is a forward-looking proxy of risk aversion. This is because option contracts are forward-looking contracts. A European option contract gives its buyers the right to buy or sell (depending on whether it is a call or a put option, respectively) the underlying asset (in our case the S&P 500) at a pre-specified time in the future (maturity day) and at a pre-specified price (strike price). Therefore, the market index option prices are expected to be informative about the future state of the economy. Moreover, the informational content of option market prices is expected to be richer than that of other financial instruments. This is because it is well documented that the option market tends to attract more sophisticated investors than other markets on which the standard economic indicators rely. This is due to the fact that options are more complicated instruments. They offer leverage, and they often enjoy smaller transaction costs. A remark is in order at this point. The previous discussion relies on the implicit assumption that the options market is highly liquid (in the sense of high options trading volume). The S&P 500 index option market meets this assumption. In the case where the option market is not liquid, then market option prices are expected to be less informative, and as a result the forecasting performance of IRRA may be decreased. We will revert to this point later. Regarding (ii), a decrease in IRRA predicts an increase in economic growth because investors boost investments when they become less risk averse. Conversely, an increase in risk aversion points to a slowdown in growth because individuals are less likely to invest when they become more risk averse. The above show that IRRA is a natural choice for the purposes of forecasting the future state of the economy. It is forward-looking, uses high-quality information embedded in option prices, and measures the risk aversion of investors, naturally related to economic growth. We extract IRRA by using end-of-month S&P 500 index historical and option data; the latter is obtained from the OptionMetrics IvyDB US database (academia's definitive source of historic options pricing data). The data spans from January 1996-August 2015 for the U.S. It includes events of significant importance such as the early 2000s recession, the August 1998 Russian crisis, the 2007-2008 financial crisis, and the subsequent 2008-2009 Great Recession. The extensive sample is a high hurdle for the proposed predictor to pass, as it includes events of great economic turbulence, which makes predicting economic growth even more challenging. To compute IRRA, we need data for four input variables. We estimate IRRA by using the last 30 end-of-month observations of four variables related to the monthly returns of the S&P 500 index: the monthly risk-neutral volatility (which is related to the CBOE VIX index), the monthly risk-neutral skewness (which is related to the CBOE Skew index), the monthly risk-neutral kurtosis, and the monthly realized volatility. As a result, IRRA concisely synopsizes the information contained in both the S&P 500 option market (via the three option implied variables) and the S&P 500 (via the S&P 500 realized volatility) and serves as a forward-looking/option-implied estimate of risk aversion of the average U.S. investor. We compute these inputs by using a standard methodology. We compute the three option-implied variables by using well-known formulae, which do not rely on restrictive assumptions, and amount to forming portfolios of call and put options with different strike prices and maturities. We compute the realized volatility of the S&P 500 by using five-minute high frequency S&P 500 returns obtained from Thomson Reuters. Given that the employed options have different maturities, we construct the IRRA to correspond to an investor who has a constant 30-day horizon at any point in time. This is analogous to the CBOE VIX index, which reflects the implied volatility of synthetic options which have a 30-day constant maturity at any point in time. The data sample used in the original study allows us to compute IRRA over the period from July 1998-August 2015. We use the period July 1998-September 2007 to initiate the estimation of the forecasting models for out-of-sample forecasting over October 2007-August 2015. What does the U.S. IRRA look like, and how can we interpret it? Figure 1 below displays the time series evolution of IRRA. OptionMetrics has kindly provided us with updated option data until mid-May 2018, and hence Figure 1 is an updated compared to the one contained in the original study. We can see that IRRA is currently quite low, at 3.6 for May, after readings of 3.7 in April and March, implying that traders in the S&P 500 options market anticipate an increase in U.S. economic growth. The last pop in IRRA occurred in December 2013, when IRRA hit 6.8. Shortly afterward, the U.S. economy contracted by 0.9% in the first quarter of 2014. Even more revealing, in the second half of 2007 IRRA rose sharply in anticipation of the recession beginning in December of that year. IRRA reached its historic peak of 9.5 in January 2008. Afterward, the depths of the Great Recession followed, with four consecutive quarters of negative gross domestic product. Interestingly, the time series behavior of IRRA differs from that of the VIX index. Figure 2 shows the time series evolution of both IRRA and VIX. Three remarks can be drawn. First, the correlation between the two measures is almost zero (-0.05). VIX is often interpreted as the gauge of investor's fear and hence mistakenly treated as a proxy of risk aversion. However, from the perspective of financial theory, there is no reason to regard VIX as a measure of risk aversion. On the contrary, IRRA is a theoretically founded measure of risk aversion. Therefore, it is not surprising that the two variables exhibit low correlation. 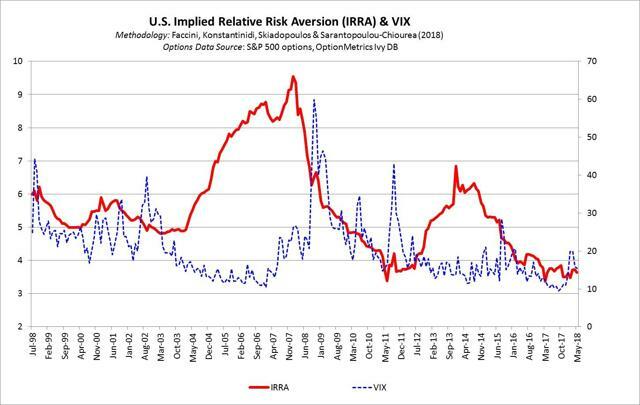 Second, VIX is far more volatile than IRRA. This is because VIX is computed by using the market call and put index prices which prevail at the time of its calculation whereas IRRA is extracted by using information from the option prices prevailing over the previous thirty months. As a result, the time series evolution of IRRA is more smooth. Third and most importantly, IRRA spiked on January 2008 well before the Lehman Brothers' collapse which occurred in September 2008 whereas VIX spiked up to an unprecedented value of about 60% on 31 October 2008 after that event (VIX had reached an even greater value of 80% on 27 October 2008 at the close of the S&P 500 option market). This seems to suggest that IRRA may be able to time the market; more research needs to be done on this before reaching a definite conclusion. Currently, this is something that we are exploring. It is worth mentioning that besides studying the U.S. IRRA and U.S. economic growth, we extracted IRRA from the index options of four more respective countries that all exhibit different trading volumes: South Korea (KOSPI 200), the UK (FTSE 100), Germany (DAX), and Japan (Nikkei 225). This sheds further light on the properties of IRRA as a future economic growth predictor. Data used to extract IRRA for the UK, Germany, and Japan was obtained from OptionMetrics IvyDB Global Indices. We should note that to the best of our knowledge, this is the first published study which employs this dataset. We find that the South Korea IRRA predicts South Korea's economic growth too, over and above well-known predictors. However, IRRA did not predict economic growth for the UK, Germany, or Japan. This suggests that IRRA predicts economic growth in cases where it is extracted from the prices of index options that exhibit high trading volume. South Korea's KOSPI 200 index option markets have the highest trading volume in the world, followed by the U.S.' S&P 500 index options. The UK, Germany, and Japan exhibit far lower trading volumes. In 2014, the aggregate trading volume was 462 million contracts for the KOSPI-200 options. This figure is greater than the 2014 aggregate trading volume of each of the other index options that we consider: S&P 500 at 223 million, Nikkei 225 at 26.7 million, DAX at 20.8 million, and FTSE 100 at 8.6 million. The fact that IRRA forecasts the future state of the U.S. and South Korean economy, whereas it does not do so for UK, Germany, and Japan, comes as no surprise. As we stated before, the performance of the IRRA relies on using the informational content of options market prices. The more liquid the index option market is, the richer the IRRA's informational content for the future state of the economy. U.S. and South Korean index option markets are far more liquid than those of the other considered countries. Who should be interested in using the IRRA variable? Anyone interested in obtaining a forecast about the future state of the economy should be interested in using the IRRA variable. As a result, firms with business dependent on economic conditions, retail stock investors, institutional investors such as mutual funds, pension funds, and hedge funds (e.g., macro funds), financial institutions, and policy makers (governments, central banks) should consider this variable. May I conclude by making three related remarks. First, we do not claim that the IRRA variable should replace all existing economic indicators. On the contrary, our research clearly shows that IRRA should be used in conjunction with existing predictors of economic growth. Second, the IRRA variable should not be treated as a "crystal ball." Incidentally, this is also not the case with any other predictor variable. Our argument is that IRRA should be added to the list of current predictors and monitored regularly so that any interested party makes a decision based on the full list of collective variables. Finally, on a more philosophical side, option markets have been occasionally blamed to be responsible for financial crises including the recent 2007-2009 financial crisis. My purpose is to not take part in this debate, yet our IRRA variable shows that option markets provide a benefit to the society to the extent that it contributes, with other variables, to predict future states of the economy. Being equipped with a list of leading indicators of economic growth, enables all interested parties to plan activities, policies, and investment decisions in the most beneficial way to them.